Vinca minor is a spreading evergreen commonly cultivated as a groundcover. Although this trailing vine is abundant in American residential landscapes and now naturalized in much of North America today, the plant is originally native to southern Europe and some parts of Asia and the Middle East. The plant contains more than 50 alkaloids, including vincamine. Because the aerial parts of the plant are harvested have astringent properties, the dried herb is used topically in poultices. 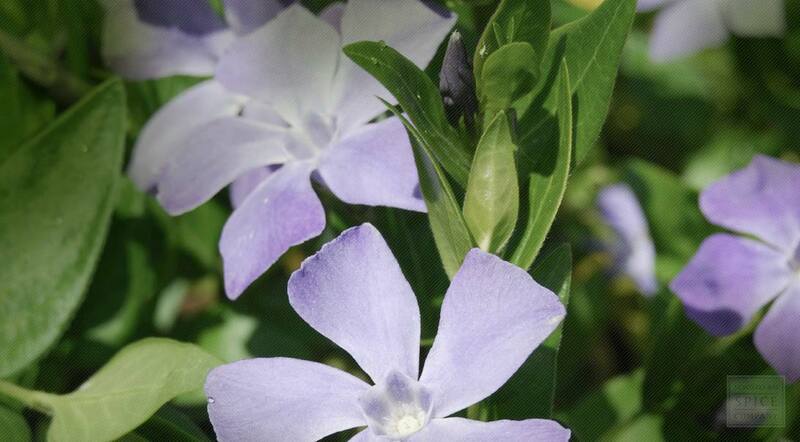 Periwinkle is also tinctured or used to produce infused oils, salves and ointments. The herb is sometimes added teas, but keep in mind that excessive use or high doses can be toxic. Vinca minor is a trailing, viny subshrub of the Apocynaceaevfamily, The plant spreads along the ground and roots along the stems to form large clonal colonies, occasionally scrambling up to 40 cm (16 in) high however they do not twine or climb. The leaves are evergreen, opposite, 2–4.5 centimeters (0.79–1.8 in) long and 1–2.5 centimeters (0.39–0.98 in) broad, glossy dark green with a leathery texture and an entire margin. The flowers bloom mainly in early spring to mid summer and are solitary in the leaf axils; they are violet-purple (pale purple or white in some cultivated selections), 2–3 centimeters (0.79–1.2 in) diameter, with a five-lobed corolla. The fruit is a pair of follicles 2.5 centimeters (0.98 in) long, containing numerous seeds. The closely related species Vinca major is similar, but larger in all parts, and also has relatively broader leaves with a hairy margin. The genus name probably derives from the Latin word vincire, meaning "bind", as the long creeping vines were used to prepare garlands. 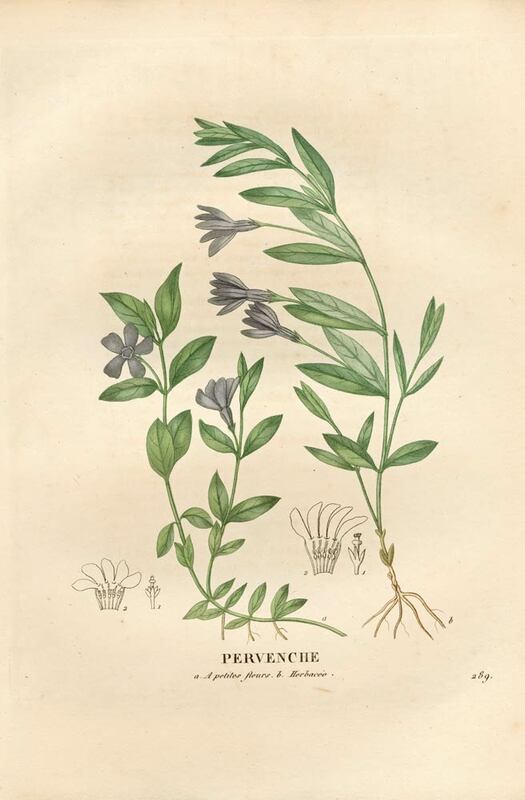 The species name refers to the smaller size in respect of the similar Vinca major. Vinca minor is native to central and southern Europe, from Portugal and France north to the Netherlands and the Baltic States, east to the Caucasus, and also southwestern Asia in Turkey. Periwinkle is commonly grown as a groundcover in temperate gardens, fields, woodland edges and is considered to be invasive in many areas. Periwinkle does best in part sun, as it will not flower as well in full shade. Prefers rich soil, does well in heavy clay or dry soil. Easily propagated via division in spring or fall. Plant divisions directly into the garden location. The leaves and aerial parts are gathered in the spring and dried for later use. Roots are harvested in autumn. Store dried periwinkle in an airtight container in a cool, dry place.